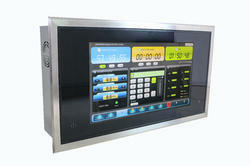 We would like to introduce ourselves as the manufacturers and suppliers of Surgeon Control Panel. All the controls for the modular operation theatre are provided on a membrane / single touch screen monochromatic graphic display . This micro controller based electronic control panel is mounted directly on the theatre wall. 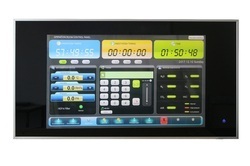 We are in the process of developing the multicolor TFT display control panel.All our control panels are CE Marked. 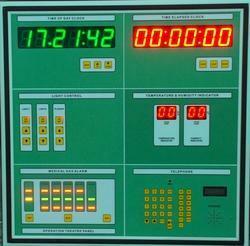 We can customize each segment of the control panel as per the requirement of the customer. We would like to introduce ourselves as the manufacturers and suppliers of Touch Screen Surgeon Control Panel. 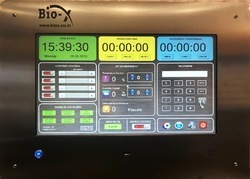 All the controls for the modular operation Theatre are provided on a membrane / single touch screen monochromatic graphic display . This micro controller based electronic control panel is mounted directly on the theatre wall.We are in the process of developing the multi colour tft display control panel.we can customize each segment of the control panel as per the requirement of the customer. We are also manufacturing the led based peripheral ceiling light for modular operation theatres. Clock – with inbuilt battery, time setting options. Stop watch – along with start, stop, reset buttons. Monochromatic touch screen with the features required by you. For light control- the type light used and the speifications of choke / transformer in the light. All the external wiring need to be provided up to the control panel by the customer. 1. High contrasts, high luminance and with high strength outer box. 2. Using anti scratching glass providing easy cleaning. 3. Using ultrasound touch panel, High density touch accuracy, more than 10,000 point per square inch. 3. 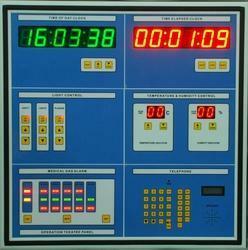 Time – Real time clock. Surgeon Control Panel for the modular operation theater are provided on a membrane type and touch screen type, micro controller based electronic control panel which is mounted in the theater wall. The fascia is made with superior quality UV resistance membrane with sterilization feature. The control panel consist 7 Tiles. We can develop the product as per requirement of customer. These tiles as below. All high voltage equipment is installed in a separate enclosure The remote cabinet will house the operating lamp transformers, mains failure relays, electrical distribution equipment and circuit protection equipment for all circuits within the operating theater. 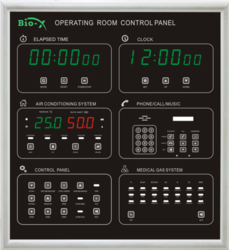 All the controls for the modular operation theater are provided on a membrane type, micro controller based electronic control mounted in the theater wall panel. The control panel is user friendly and case of operating and maintenance purpose. We would like to introduce ourselves as the manufacturers and suppliers of Membrane Type Surgeon Control Panel. 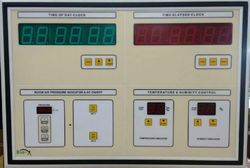 All the controls for the modular operation theatre are provided on a membrane / single touch screen monochromatic graphic display . This micro controller based electronic control panel is mounted directly on the theatre wall. All our control panels are CE Marked.We can customize each segment of the control panel as per the requirement of the customer. We would like to introduce ourselves as the manufacturers and suppliers of Modular Operation Theatre Control Panel. 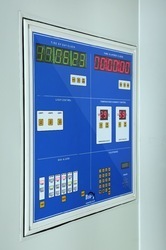 All the controls for the modular operation theatre are provided on a membrane / single touch screen monochromatic graphic display . This micro controller based electronic control panel is mounted directly on the theatre wall. Modular Operation Theater offered can be made available by us in different construction finish choices as demanded by the customers. 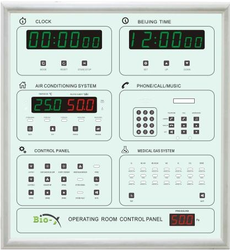 Surgeon Control Panel– We are Surgeon Control Panel manufacturer in Mumbai. 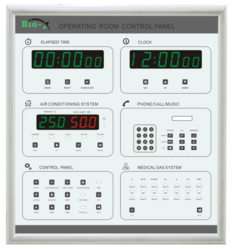 We manufacture and supply a wide range of Surgeon Control Panel. We are manufacturing the membrane type, touch screen type and monochromatic graphic touch screen panels. purpose. Control panel comprising of following. User can choose any of the services as per their requirements. flexible, enabling it to be adapted or expanded, or to accommodate new technologies. This micro controller based electronic control panel is mounted directly on the theater wall. The following features are incorporated in the control panels. 1. Operation timing - Elapsed time. —All our control panels are CE Marked. —We can customize each segment of the control panel as per the requirement of the customer. This micro controller based electronic control panel is mounted directly on the theatre wall. All our control panels are CE Marked.